Next Article Helensburgh's 2012 celebrations — a great day! AUTHORS Iain Quinn and Alistair Deayton signed copies of their new book '200 Years of Clyde Paddle Steamers' — which started with Henry Bell's Comet — aboard the paddle steamer Waverley on Friday August 10 2012 on a trip from Glasgow to Rothesay. 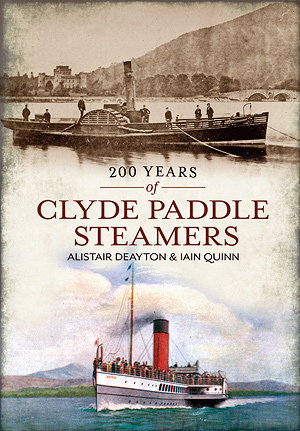 In the book Deayton and Quinn look at the two centuries of Clyde paddle steamers, illustrating the most famous, such as the Columba, Jeanie Deans and Waverley, — as well as the piers they sailed from, from Rothesay to Helensburgh and from Loch Goil to Loch Long. When Helensburgh hotel owner Henry Bell began to operate Europe’s first ever commercial steam ship from Glasgow to Greenock, no longer were ships be dependent on the tide or the wind. The Comet was built by John Wood, of Port Glasgow, and was fitted with paddle wheels. Her first voyage from Glasgow to Greenock was made at about 5mph against a headwind. Advertised to sail on Tuesdays, Thursdays and Saturdays from Glasgow, the Comet operated the first scheduled steamship service in Europe. It was the start of a revolution that would see the Clyde as the greatest shipbuilding river in the world, and the river’s estuary as a haven for pleasure steamers and puffers calling at the remote loch-side piers and inlets. Companies such as David MacBrayne’s and the Caledonian Steam Packet Co. would be formed to operate steamers far and wide, a legacy kept alive today by Paddle Steamer Waverley. The Waverley marked the bicentenary of the Comet with the special sailing August 10. She left Glasgow at 1000 and Dunoon at 1210 for time ashore at Rothesay. On the return voyage she departed from Helensburgh at 1600 and Greenock at 1630 for an evening jazz cruise. She then made her way back up river to Glasgow arriving at 1810 before departing once again at 1900 to continue the evening jazz cruise in celebration of 200 years of steam navigation. A colour leaflet marking the link between the Waverley and the Comet was compiled, and can be downloaded from the Downloads area of this website. The new title is published in paperback at 128 pages by Amberley Publishing, priced at £14.99.